In a splashy kick-off event Wednesday, Apple unveiled its new iPhones. The 2018 line of smartphones includes the iPhone Xs, iPhone Xs Max, and iPhone Xr. The name had leaked prior to the announcement and had most people saying iPhone "excess" in their head and online. Well, it turns out Apple's new sensation is not pronounced like that, even if you believe it'd be a fitting name for the star product of a trillion-dollar company. 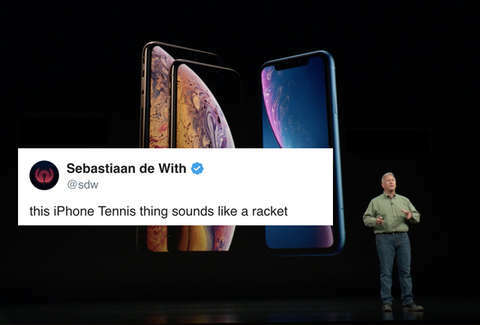 It's called the iPhone "ten s." Instantly, everyone who thought it was "excess" heard "tennis" and the cycle of having no idea what to call the iPhone exes continued. All this beautiful confusion launched a thousand jokes on social media because [checks notes] that's what Twitter is for. The jokes included some obvious misinterpretations, but also a surprising number of people with the devil inside them making ridiculous, unexpected INXS references. If you didn't follow along online during the announcement, here comes what you need: Here are some of the best jokes from all around Twitter about the new iPhone. How do you pronounce the new iPhone XS? Tough decision which one to get. (Obligatory comment on the leaked but probably real iPhone names). Despite a price tag that will mystify some this time, there were plenty of other tweets where people told the iPhone it was the one thing they need. That includes lots of people excited about colors beyond black and white. However, all that pining is in vain. Fans will have to wait a while until they can live the wild life with their new iPhone. It won't be jumping into stores until later this month.